Cocoon aims to connect high potential job seekers to cool startups from The Netherlands. We offer a broad range of jobs in startup and tech oriented companies in the fields of online marketing, mobile and web development, design, as well as sales/business development. Create a profile in a few easy steps and Cocoon will do the rest. 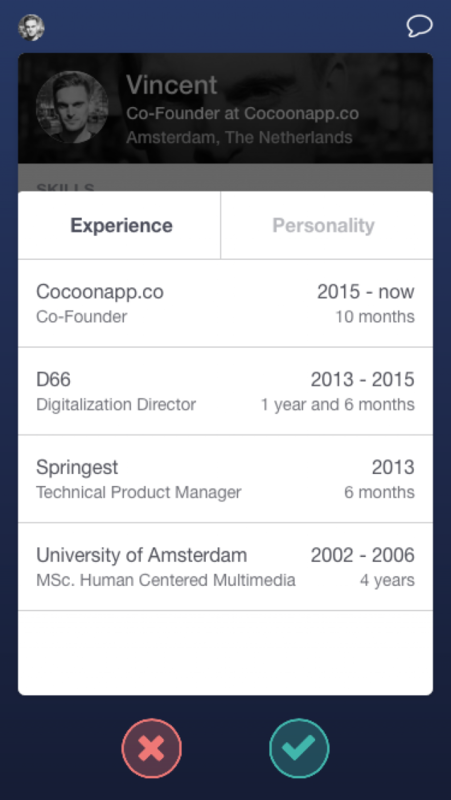 Thanks to our matching algorithm, jobs that fit your skill-set will be suggested to you. Like the jobs that you find appealing and if a company likes you back, you get a match! Don’t be shy and start a chat! Who knows, maybe it will lead to a coffee the next day at your dream job at a startup in Amsterdam or another city in Holland. Casual, efficient and practical, Cocoon is a great alternative for companies and candidates to easily connect and see if they could create a sustainable work relationship.